World Challenges are game competitions against random and unknown players. Twelve Neopia worlds have their own challenges and they are going on from the third minute of the hour to the last second of the hour. There is a low entrance fee of 100 Neopints, which acts as a prize pool for the winners. You can access the World Challenges index page here or visit a particular world by clicking on the Neopia icon at the bottom of the game. Conclusion: my best chances to win World Challenges are at Meerca Chase II and Stowaway Sting. Therefore, I should go play these two games and see the scores I can come up with. If they are likely to win in this hour World Challenge, I would enter into the challenge and then submit my score. Now, you're probably wondering how to win these challenges. Once you have entered the challenge, all scores that you send during the hour will be counted towards the challenge. It is possible to send more than 3 scores towards the challenge if you reload the game after entering into the challenge. You win against your opponent and gain 1 point to your tally. You tie against your opponent and your tally stays the same. You lose against your opponent and lose 1 point to your tally. 5 players entered into the World Challenge and have their scores processed. Your tally is 0 or greater. Total of places eligible depends of the number of player entered into the challenge; the minimum is 2. There are 3 different ways to sort the highscores table and to win a World Challenge. Firstly, you can win because you have the greater tally. Secondly, you can win by having the highest score of the hour. Lastly, you can win by having the highest score total. Only one prize will be awarded to you, even if you are at the first place for all of the three categories. In our example, 4 players would win the world challenge even though some of them are qualified to win in more than one category. If you want to be successful in World Challenges, you will need to learn timing. An important thing is to wait a few minutes before entering into the World Challenge so you get the chance to see what are the average scores being sent. 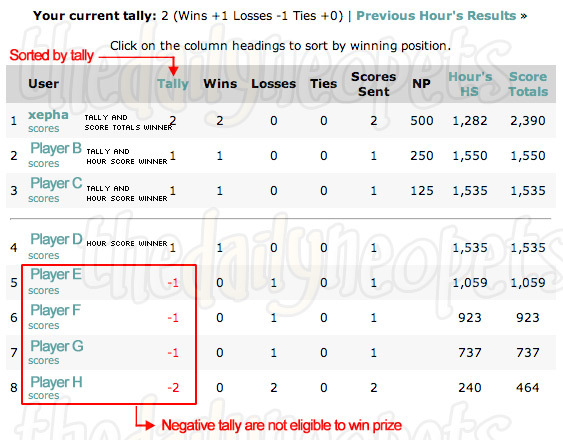 Some hours are also easier to win because many people with scores below average are taking part or because someone with low scores keeps sending more of them. You should take advantage of these occasions to enter into the World Challenges. Don't send more scores than necessary. It is better to carefully watch your ranking and to send scores as you need them to progress than to send 3 scores to discover that your tally is now -1 and you have no chances to win in the remaining time. Build your score before entering into a challenge. If you had the intention to enter into this hour World Challenge and realized that opponent are too tough for you, keep your score for another hour. Do not score above the score review limit! If your score is too high and have to be reviewed by TNT, it won't count towards your world challenge. Each game have its own review limit. If you don't know what is the limit for a particular game, check the highscore table on the first of the month. Do not play World Challenges on your side accounts.You are not allowed to play games on your side accounts and doing so will result having your account frozen. As they say, you won a piece of artwork! World Challenges Map Pieces are very valuable items. Once you collect all 20 pieces of a map, you can redeem your prize. For each completed map, you get 2,000 Neopoints and a random item. Prizes include paint brushes, petpet paint brushes, petpets and red codestones (see table below for a complete list). There are three "levels" of WC maps, with the higher levels giving out better prizes. This is not always true as Key Quest has been giving out some of these prizes too, causing their deflation. Once you have convert a level 1 map from a specific world, you start to earn level 2 map pieces for that same world. Then you move over level 3 map pieces for that world. Once you have converted a level 3 map, you have to clear you galleries before you can start over. Map pieces are awarded randomly, which means that you will get duplicates pieces. You can either trade them for other pieces, sell them in your shop or keep them for later uses. If you decide to trade them, you can look on the games neoboard for World Challenge Trade Center thread. It is full of users just like you who want to trade their map pieces! Here is the complete list of prizes you can get from World Challenges. If you get a different prize, feel free to contact us. World Challenges are one of the easiest way to win great prizes such as Paint Brushes and Petpet Paint Brushes. They are also a way to revive your interest for Neopets flash games. Good luck in your challenges! The Snowager is awake. He'll be sleeping in 33 minutes, 14 seconds.